At Granbury Dental Center, we do more than just clean and fix teeth. We look at your entire oral health system, as well as how it relates to your overall health and well-being. This includes the alignment of your teeth and bite, the function (or dysfunction) of your jaw joint or TMJ, as well as teeth grinding and clenching, chronic orofacial pain and sleep apnea. If you live with daily jaw pain that radiates into your head and neck, you may be one of millions of Americans suffering from TMJ or TMD. Thankfully, your Granbury dentist has a simple, affordable, non-invasive solution that can stop your pain at the source. 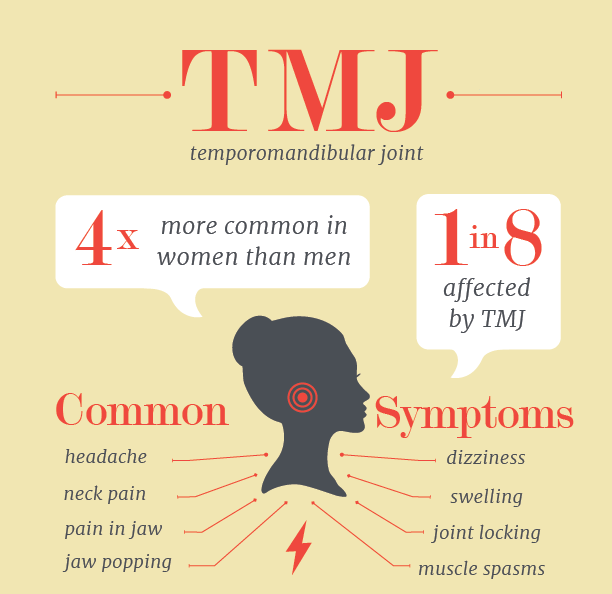 TMJ stands for temporomandibular joint, or the jaw joint. TMD stands for temporomandibular joint dysfunction, although the two terms are often used interchangeably. Sometimes the dysfunction is even called TMJD, just to make things confusing. For simplicity’s sake, we’ll use TMJ from here on to describe the joint as well as the dysfunction, as this is the most commonly used term. Your jaw joint is a complex structure, consisting of the actual joint itself, connecting your lower jaw to your skull with the help of a network of muscles, nerves, and tendons that allow you open and close your mouth. Any type of stress, imbalance or injury to the jaw joint can cause TMJ. TMJ can manifest in the form of teeth grinding and clenching, jaw soreness, lockjaw, and chronic headaches and migraines. For some, it’s a minor nuisance, while for others the chronic pain can be unbearable and can drastically impact their quality of life. We all hold our stress in different parts of our body. Some of us clench our fists or have restless legs, some of us hold our shoulders up so high our neck disappears entirely. But for many, especially women, we hold our stress in our jaw joint in the form of clenching and grinding our teeth. When we talk about stress, it’s no wonder that women in their childbearing years make up 90% of TMJ sufferers. Whether it’s the stress of avoiding pregnancy or the stress of raising children, women tend to grit their teeth and bear it with grace. While stress is one of the primary contributors, there are many other factors that may explain the disparity between female and male TMJ. That’s not to say men cannot suffer from TMJ, but the large majority of TMJ sufferers are women. If any of the above sounds familiar, we would love to sit down with you and discuss your symptoms and treatment options. We need to determine the source of your TMJ before we can come up with a treatment plan to help you. We will perform a comprehensive exam of your teeth and jaw, review your medical and dental history, and take digital x-rays. We will also measure the range of motion of your jaw. We use advanced T-Scan technology to digitally measure your bite to assess for tooth and bite misalignment, muscle force imbalances and premature contacts. We will carefully examine the physical structure of your jaw to see if anything is misaligned and assess for any type of injury or trauma. If your TMJ is the result of teeth and bite misalignment, we may be able to correct the problem with orthodontics. Whether bruxism (teeth grinding and clenching) is a cause or a symptom of your TMJ, a custom night guard can protect your teeth and allow your jaw joint to rest and heal overnight. If your TMJ is the result of jaw misalignment or injury or your TMJ is severe and debilitating, you may require corrective surgery on the joint itself. There are many awareness practices and at-home techniques you can incorporate into your daily routine that may help minimize your symptoms. Awareness is the first step to recovery. Be aware of your clenching and grinding, and make an effort to stop when you feel yourself doing it. Avoid chewing gum, and use a cold compress to reduce pain and swelling. You can do gentle massage and pressure point techniques to relax the jaw, face, and neck muscles. If you have any questions about TMJ or would like to schedule a visit with your Granbury dentist – Dr. Bruce Baird or Dr. Jeff Buske at Granbury Dental Center – give us a call at (817) 776-8073 or request an appointment online today!